The three parts of Argo are seen in context, Vela (the Sails) to the lower left, Puppis (the Stern) at center and right, upper Carina (the Keel) at bottom. Naos (Zeta Puppis) is at center. Directly above it is Tureis (Rho), and to the right of Tureis is Asmidiske (Xi). To the right of Naos find Pi; the pair below Pi is made of L2 and Li, while to the right of these is Nu. Sigma Pup is just up and to the left of L2. q Pup is up and to the left of Naos. Suhail, Lambda Velorum, is to the left and a bit down from Naos, while brighter Regor (Suhail al-Muhlif) is down and to the right of Suhail. V Puppis is the brightest of the trio down and to the right of Regor. Delta Vel is then well down and to the left of Regor, Markeb (Kappa Vel) is to the left of Delta, and Psi up and to the left of Suhail. At the lower left corner shines Mu Velorum; p Vel is just barely up and to the right of it, while q Vel is about 5 times farther pretty much along the same line. Phi is between Kappa and Mu, q Vel up and to the right of Mu. Bright Canopus, in Carina, lies near the bottom edge to the right (with Tau Pup just up and to the left of it), while Chi Car is just below Regor. Avior (Epsilon Car) is off the picture down and to the left of Chi Car. Canis Major with brilliant Sirius is at upper right. Pyxis is at center, with Antlia at center, while part of southern Hydra is at upper left. Delta and Kappa Vel are part of the False Cross. 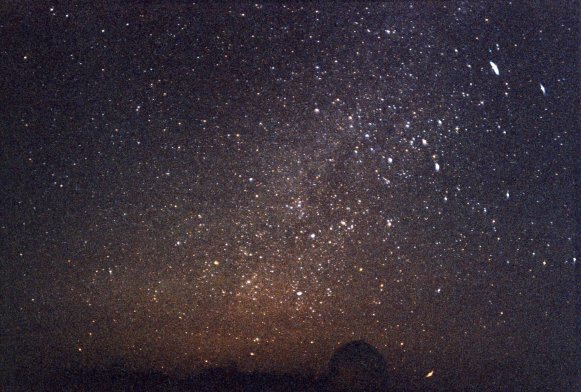 The Milky Way runs to the left of Canis Major, then brightens as it passes south through Puppis and Vela. Note the dark dust lane running down the middle. See Puppis West in a different context. Vela has a star with an orbiting PLANET. See Argo from Bayer's Uranometria of 1603.